Fort Missoula (1877-1946) - Established on 25 Jun 1877 as Post on the Missoula by Captain Charles C. Rawn, 7th U.S. Infantry. Located in Missoula, Missoula County, Montana. Renamed Fort Missoula on 8 Nov 1877. Decommissioned in 1947. Fort Missoula Old Post Exchange. 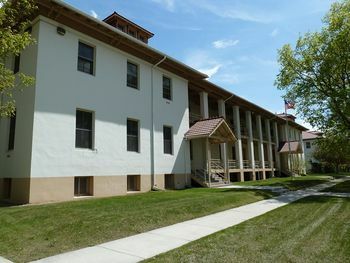 Fort Missoula Old Double Barracks Building. Fort Missoula Old NCO Quarters (1878). Fort Missoula was established in 1877 by two companies of the 7th U.S. Infantry at the request of citizens who were concerned about hostile Indian tribes. The troops participated in the Battle of Big Hole against the Nez Perce Indians led by Chief Joseph and Looking Glass. The Fort was later home to the 24th and 25th Black Infantry Regiments in the 1880s and 1890s. It was continuously garrisoned up until the Spanish-American War when, in 1898, the 25th U.S. Infantry was sent to Cuba. The 25th did not return to Fort Missoula and the post was only sporadically garrisoned until World War I. The post was remodeled and updated between 1908 and 1914. The remaining officers quarters, enlisted barracks and the hospital reflect that period of construction. During World War I the post was a training school for Army auto mechanics and the 4th U.S. Infantry Regiment, which supervised Civilian Conservation Corps (CCC) workers during the Great Depression. The CCC was still working on the post in April 1941 when the mission of Fort Missoula dramatically changed. 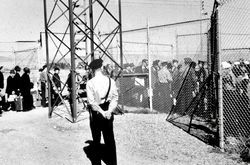 New arrivals at Fort Missoula Alien Detention Center , c1942. 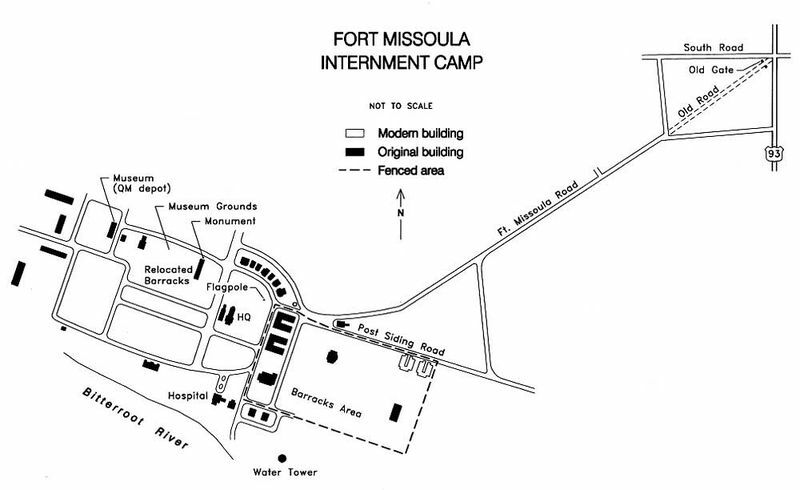 On 9 Apr 1941, the War Department issued a 5-year permit to the Department of Justice for the use of all of Fort Missoula as an alien detention center. Other tenants of the post, the Civilian Conservation Corps, the Civil Aeronautics Administration, and the Federal Communications Commission would not be required to move. The post was found to have four permanent barracks buildings each with room for 121 men each (actually two double barracks buildings) for a total capacity of 484 men. Additional officer & NCO quarters were available but it was soon clear that temporary prefab barracks would be required to house some 1,200 non-military Italian men who had been detained since Italy entered WWII on 10 June 1940. The 1,200 Italian men were merchant seamen, World's Fair employees and the crew of an Italian luxury liner seized in the Panama Canal. By 21 May 1941, 608 Italians were already interned at what was now known as Bella Vista and it was clear that additional temporary barracks would be needed. In the end, some 30 prefabricated barracks building sections were shipped to the fort, where they assembled as single, double and triple units, each section 20 feet wide and 45 feet long. The assembled buildings were located in a barracks area behind the two permanent double barracks buildings and the whole area was fenced in. Fort Missoula Alien Detention Center (ADC) Plan. Following the bombing of Pearl Harbor on 7 Dec 1941, the FBI arrested more than 1,000 prominent Japanese leaders on the west coast. Over 1,000 Japanese men who were resident aliens barred by law from becoming American citizens were held at Fort Missoula for loyalty hearings and later released to other War Relocation Centers where they were reunited with their family members. Immediately after the war, the post was used to confine U.S. Military personnel awaiting charges or courts-martial for military crimes. The post was decommissioned in 1947 but it continued as a base for Army National Guard, Naval Reserve units, other government agencies, and civilian organizations. Most of the temporary buildings were sold and removed. 1910-04-14 1911-05-14 Major Parke, John Spry 2801 In Cullum's Register, dates overlap with the next. 1911-04 1912-04-25 Lt. Colonel Kennon, Lyman Walter Vere 2928 Promoted to Colonel, 28 Mar 1912 while commanding. In Cullum's Register, dates overlap with the preceding. Fort Missoula is now home to the Lolo National Forest headquarters, Bureau of Land Management's regional headquarters, the National Guard, and numerous nonprofit organizations, including the National Forest Foundation. 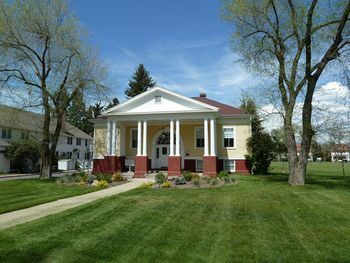 In April 2000, the Northern Rockies Heritage Center received title to much of the property, now designated as the Fort Missoula Historic District and listed on the National Register of Historic Places. The grounds include thirteen historic buildings from the rebuilt fort, three buildings from the original fort, a small military cemetery, and a parade ground. The rebuilt buildings include the Headquarters, the Post Exchange, a Quartermaster Storehouse, the Hospital, two Barracks and seven Officer's Quarters, all now repurposed. 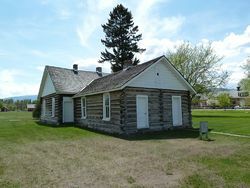 The Quartermaster Storehouse building now contains the Historical Museum at Fort Missoula. 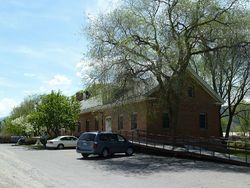 The original fort buildings include a Carriage House (1880), a stone powder magazine (1878) and restored NCO quarters (1878). Location: Missoula, Missoula County, Montana. This page was last modified 10:09, 17 March 2019 by Bill Thayer. Based on work by John Stanton.